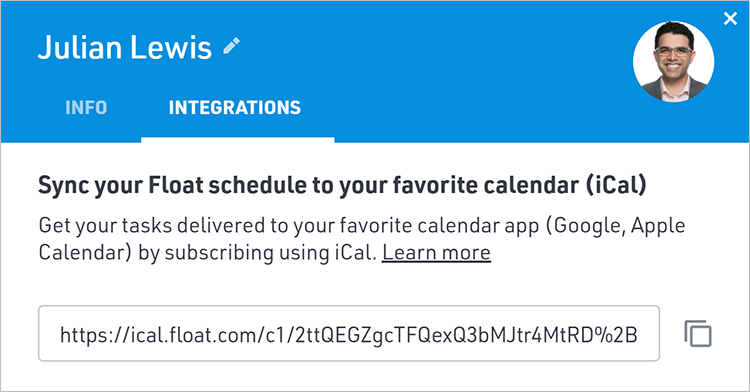 If you're a Scheduled user, you can export your Float tasks to your favorite calendar app (Google, Apple, Outlook) using the iCal subscription link found within your profile. Select My Info from the global nav at the top of Float and click Integrations. Copy the iCal link and paste the URL where requested in your preferred calendar app. The default calendar name will appear as "Float Schedule". Your new calendar will automatically sync with Float going forward. Only tasks from the last three months are imported to your calendar app. If a task start date is more than three months old, it will not appear. Google and Outlook calendars typically sync every 24 hours, while Apple allows you to set the refresh rate when subscribing. Tasks cannot be edited within the calendar app. All changes must be made within Float. iCal currently ignores Float non-work days (e.g., weekends and holidays). If a single task runs from Friday to Monday, and the default non-work days are Saturday and Sunday, the task will pass through the weekend. Tasks must be set to a specific time in Float in order to appear at that time in your calendar app. Otherwise, they will appear as all day events.